Hawai‘i’ is among the most isolated archipelagos on Earth. This isolation created a unique biogeography, and our native wildlife, both marine and land-based, reflect our islands’ unique place in the tropical ocean. Hawai‘i has no native land mammals save for the diminutive Hawaiian Hoary Bat, a reclusive and rarely seen creature. Our nearshore waters provide habitat for a number of marine mammals – whales, dolphins, and the endangered Hawaiian Monk Seal. Hawai‘i is also home to sea turtles, dozens of seabird species, and a host of distinctive endemic forest birds, which are found nowhere else on earth but within our shrinking native forests. Catching a glimpse of these marine visitors and native inhabitants is typically more difficult than in other places where animals are larger and populations are more numerous. But for those wildlife enthusiasts willing to get a little off the beaten path, the reward may include an encounter with some of the rarest creatures on the planet. 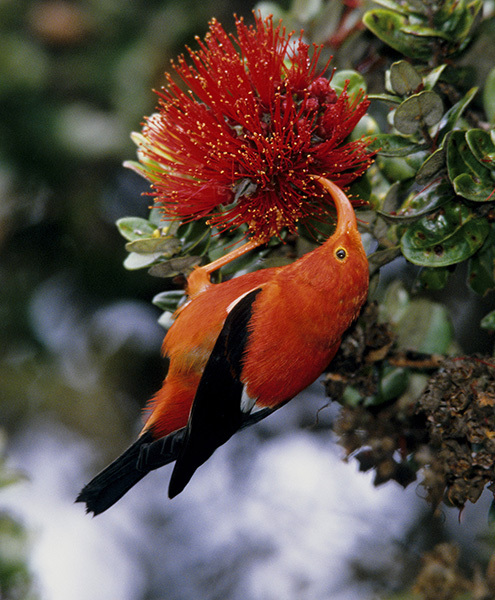 Hawaiʻi is home to a diverse variety of native and endemic birds, as well as a myriad of historically introduced species. 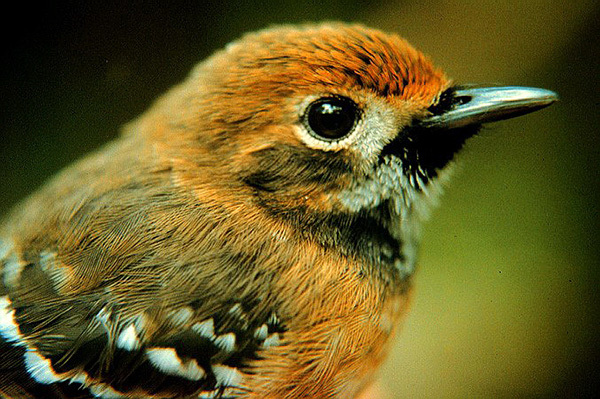 Due to a variety of factors including development, loss of native forest lands, and introduced avian diseases, we are facing an extinction crisis, especially for Hawai‘i’s endemic Forest Birds. Many have already disappeared, and others are critically endangered. For those that remain, Hawaiʻi’s protected parklands and forest reserves provide safe haven and unique opportunities to catch a glimpse of these uniquely adapted species’ found nowhere else in the world. Albatross pair at Ka’ena Point, O’ahu. Photo by Kelvin Lu. 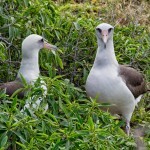 Seabirds, including wedge-tailed shearwaters, noddies, and Laysan Albatrosses nest in selected coastal locations on the main Hawaiian Islands, and in much greater numbers on a myriad of offshore islets, most serving as wildlife sanctuaries. Other species, such as white and red-tailed tropicbirds, and great frigatebirds can be seen soaring overhead along coastlines and cliffs. Ground-nesting seabirds are especially vulnerable to human disturbance. When visiting nesting areas, please observe all signs and barriers, and stay on established trails. Nests are often nearly invisible to hikers. 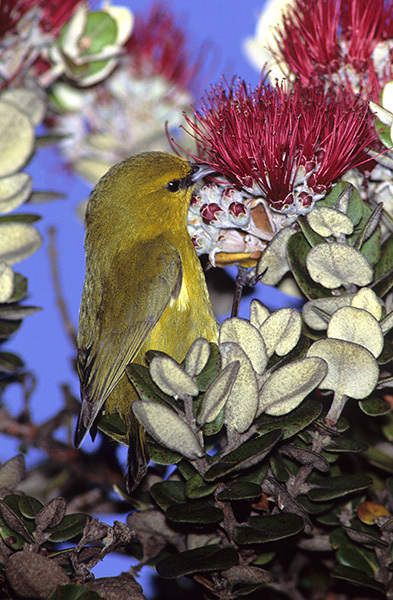 Hawaiʻi’s endemic forest birds are typically limited to higher elevations where more undisturbed stands of native forest remains. 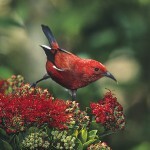 Commonly viewed species include the crimson and black-colored, salmon-billed i‘iwi, the similar colored, black-billed ‘apapane, the yellow-green ‘amakihi, and the brown and white ‘elepaio. To increase your chances of seeing these rare birds, bring along a pair of binoculars. Look for flowering native plants and trees which provide food to native honeycreepers. Stop, sit quietly, and listen for calls. Find a high vantage point and look for movement in the treetops. 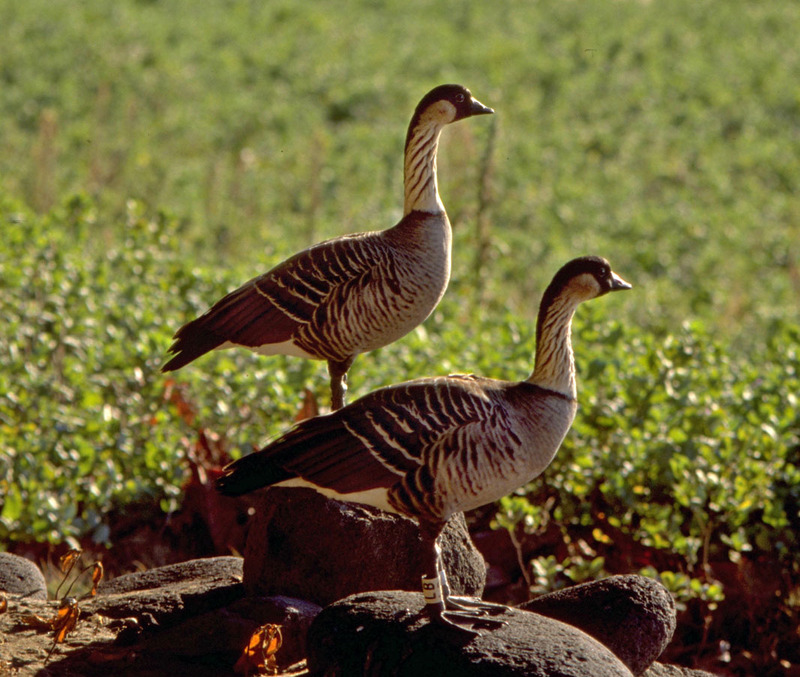 Hawaiʻiʻs State bird, the nēnē, or Hawaiian goose, nearly went extinct in the mid 20th century. 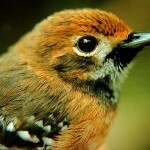 Down to just 30 living birds around 1950, a program to help the species recover has been very successful. 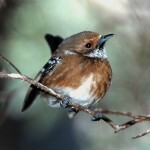 In addition to wild populations on the Big Island, reintroduced populations now inhabit Maui and Kaua’i. 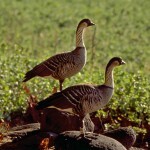 Nēnē, Hawaii’s State Bird. Photo by Tim DelaVega. 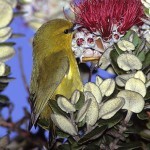 In addition to the above, many migratory and resident shorebirds and marsh birds are found in Hawaiʻi, as well as numerous historically introduced species, from cardinals to cockatoos. These introduced birds dominate in urban and lowland settings. To see the true natives, visitors must seek protected and preserved areas like our state parks. And forest reserves. Hawaiʻi hosts several species of sea turtles, but by far the most commonly seen is the Green Sea Turtle (honu). These large, gentle marine reptiles, typically 2-3 feet in shell length, frequent calm bays and shallow offshore reefs and lava shelves in Hawaiʻi where they feed on seaweed (limu). 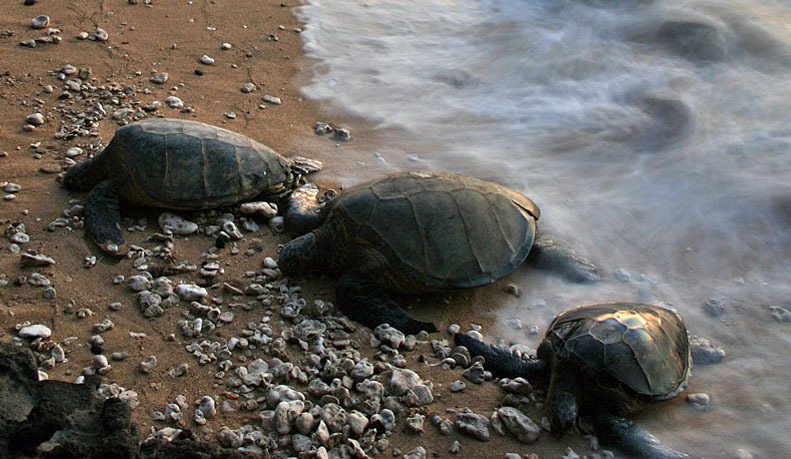 These turtles (which are actually dark brown in color) do come ashore regularly to bask and lay their eggs, although very few nest in the main islands. Most Hawaiian Green Sea Turtles migrate 800 miles north to mate and nest in the Northwest Hawaiian Islands on the sandy shores of French Frigate Shoals. In the main islands , Green Sea Turtles are rarely seen in large numbers. They prefer isolated, uncrowded beaches, so they are difficult to view reliably. There are significant populations along Kauaʻi’s Nāpali Coast State Wilderness Park, where they can also be viewed via coastal boat tours. There are also viewing opportunities within parks along the Big Island’s Kona Coast. From shore they are most easily recognized when they surface to breathe, but can also be seen feeding on the shallow sea bottom. If you are in a vessel or swimming, diving or snorkeling and encounter a swimming turtle, give them a wide berth so as not to disturb them. 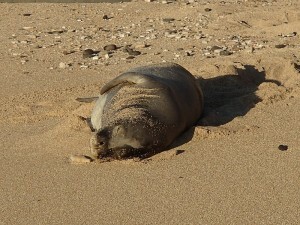 The Hawaiian Monk seal (‘ilio holo i ka uaua) is found only in Hawaiʻi, with most of the population frequenting the remote, nearly uninhabited Northwestern Hawaiian Islands. Monk Seals are critically endangered, and are the second rarest seal species on earth (their Mediterranean cousins own that distinction). Only about 100 of these solitary mammals frequent the main Hawaiian Islands, occasionally coming to shore to bask, rest, or give birth. Lucky visitors may catch a glimpse of one basking on a beach or shoreline anywhere in Hawaiʻi, but the greatest number can be found on Kaua‘i. If you are so fortunate, remember that these animals are protected by law and persons are strongly advised to maintain adequate distance (minimum 50 yards/45 meters) so as not to disturb them. Resting alone out of the water is normal and necessary Monk Seal behavior. They sleep soundly when ashore, and might seem docile, but they can and do bite when disturbed. Approaching too closely can cause them to abandon favored locations, and disrupt resting adults and nursing pups, who are particularly vulnerable. All monk seals are susceptible to canine diseases and attacks – keep pets leashed and well away from seals and areas they are known to frequent. To report marine mammal disturbance or legal violation, please call the NOAA Office of Law Enforcement Hotline: 1-800-853-1974 and then call DLNR, Division of Conservation and Resources Enforcement (DOCARE) statewide hotline: 643-DLNR (3567). Please be a responsible watcher of wildlife. Humpback whales (koholā) venture to Hawaiʻi each winter from Alaska, and are by far the most common whales seen in Hawaiian waters, although there have been sightings of fin, minke, Bryde’s, blue, and North Pacific right whales as well. Dolphins (nai‘a) are year-round residents. These magnificent animals can be viewd from shore by watching for their spouts as they surface to breathe. They also breach, leaping out of the water and creating great splashes which can be seen from a great distance at good viewing spots. Humpbacks can approach lengths of 50 feet and weigh up to 45 tons. 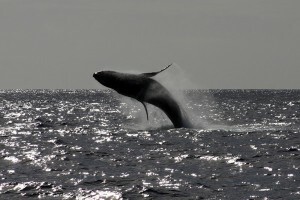 They are known for their breaching and leaping behaviors, as well as fin and tail slapping, as well as singing. 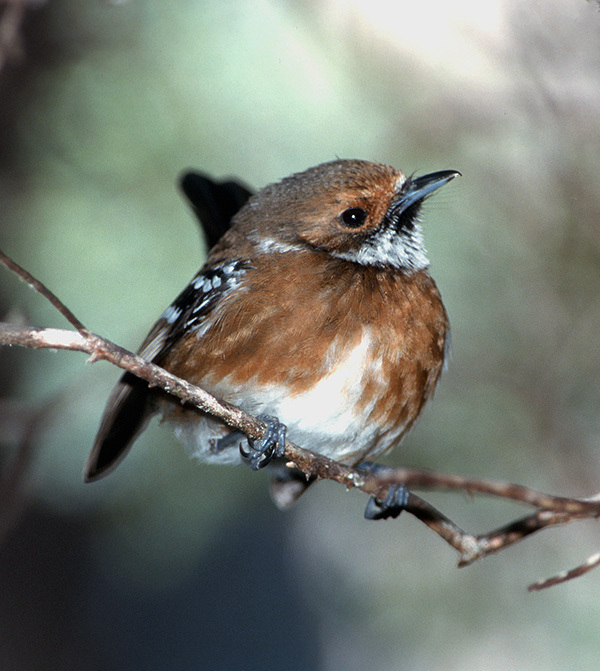 Males sing when in Hawaiian waters, but are silent when they return to Alaska, where they feed throughout the Spring and Summer. The whales mate in Hawaiʻi, and females birth their calves here the following year. Spinner dolphins live in pods often made up of dozens of individuals for protection and coordinated hunting. Common in Hawaiʻi, they frequent calm protected bays during the day where they rest and care for their young. These areas are important to avoid predators and recover from long nights of hunting in the open ocean. They are spectacular leapers, and as their name aptly suggests, they spin rapidly during their aerial manuoevers. Spinners are relatively small dolphins, measuring about 6 feet (2 meters) in length as adults, and have a distinctive coloration – dark on top, gray in the midle, and light on the belly. Wildlife is always best viewed from a distance. Many Hawaiian species are protected by law and maintaining a proper distance is required for the safety of people and animals. Animals will always behave more naturally when they are unaware of human presence. Enjoy wildlife from afar rather than approaching too closely and possibly disturbing their rest, feeding or nesting. NEVER attempt to feed any wild animals or birds. Use binoculars and telephoto lenses to get the best views. 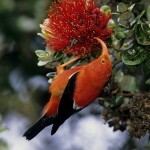 Koke’e State Park is among the best and most accessible areas to view Hawai’i’s endemic forest birds. 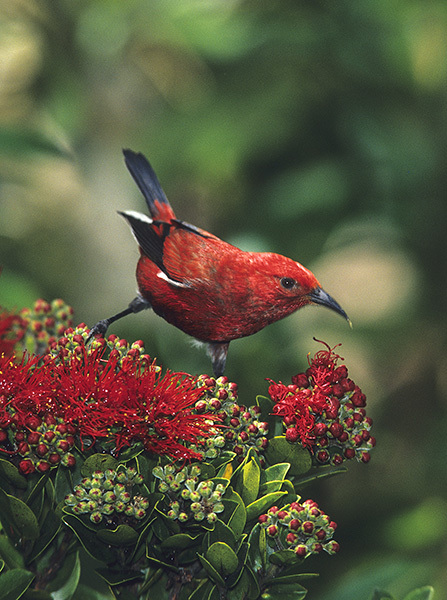 Best bets for catching a glimpse of the rare Amakihi, I’iwi, Apapane or ʻElepaio are along the Pihea Trail or Alakai Swamp trail. Early mornings and late afternoons are when the birds are most active. Humpback whales can often be seen in offshore waters fronting Hāʻena State Park and Nāpali Coast SWP. Monk Seals and Green Sea turtles occasionally haul out on remote beaches in these parks as well. 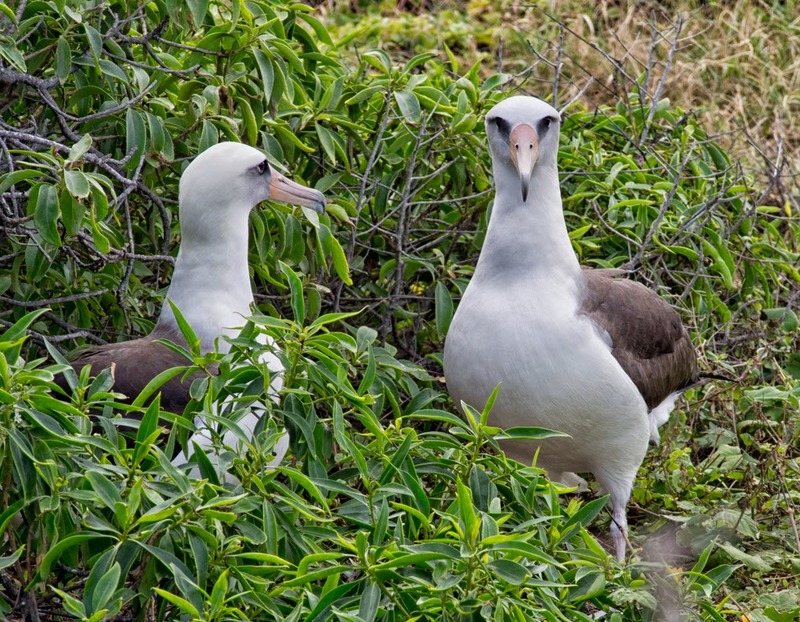 Ka’ena Point Natural Area Reserve via Kaʻena Point State Park is among the best places in Hawaii to see nesting Seabirds, including the Laysan Albatross and Shearwaters, who nest in burrows. Nesting season is from October through late Spring. The shoreline park areas also offer viewing of whales, dolphins, sea turtles and Hawaiian Monk Seals. Makapuʻu Point Lighthouse trail via Kaiwi State Scenic Shoreline. 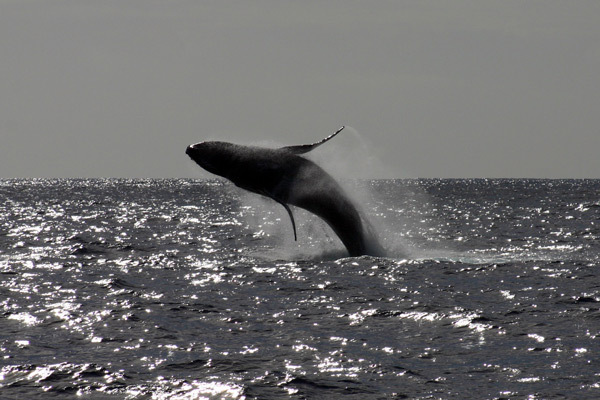 Humpback whales migrate to Hawaii each winter from Arctic waters. From about November-May (peak season is January-March), whales can often be viewed from this southeast O’ahu trail leading past the historic lighthouse. Mākena State Park offers seasonal viewing of Humpback Whales (November-May), as well as sea turtles, shorebirds and wetland birds. The sheltered waters of Kealakekua Bay State Historic Park harbors a large pod of Spinner Dolphins, and offers viewing of whales in season (November-May), as well as seabirds and the occasion raptor.